There are pros and cons of each type. Most of the air coolers tend to be bulky and taking up much space. This puts pressure on the motherboard’s PCB and on the CPU as well. 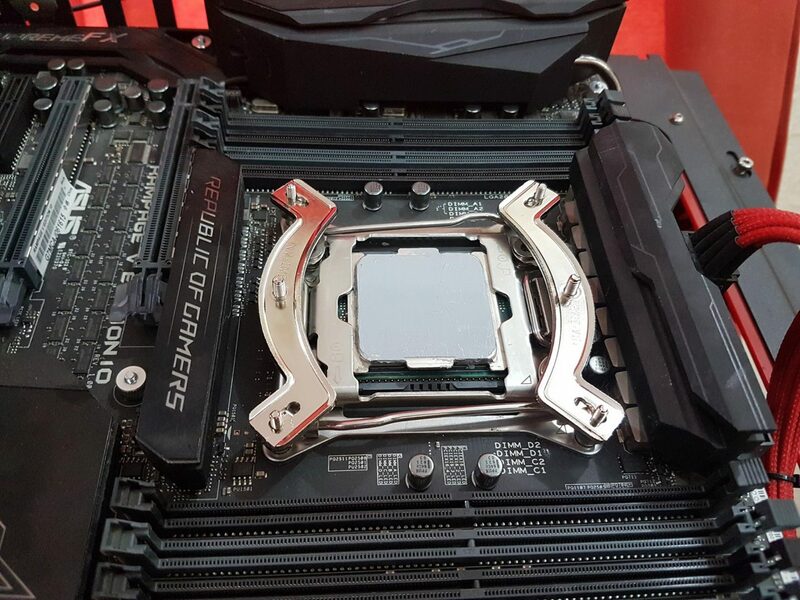 Skylake was one of the examples where many damaged CPUs were reported due to the sheer weight of the cooler. 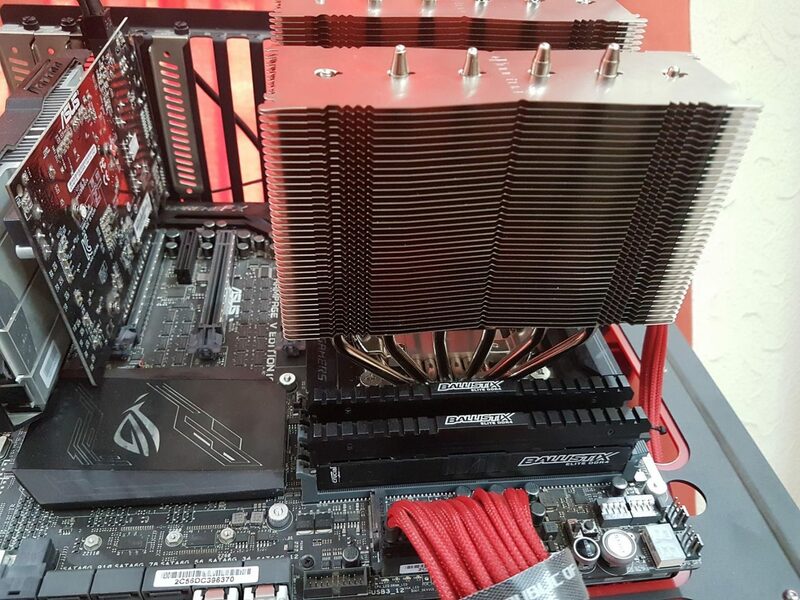 Not to mention the compatibility issues of the air coolers with RAM, the first PCIe slot and the chassis itself. 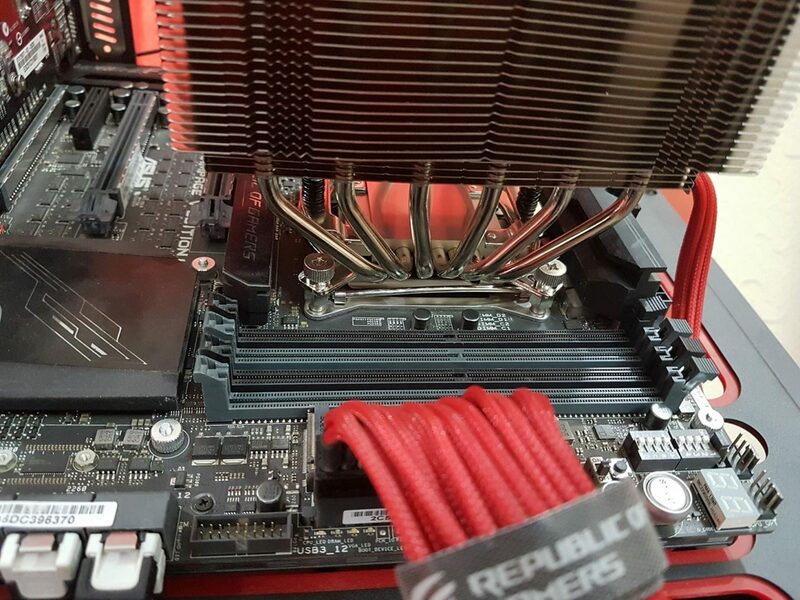 AIO/Hybrids/Custom Loop would clear that space around the CPU socket but many users avoid them for the fear of leakage. While the market for the coolers may seem saturated, it is surprising to find more competitive offerings from the old players and new players alike. 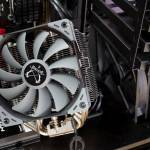 Recently, during CES 2017, EVGA, a well-known Nvidia’s AIB partner has announced their AIO coolers for CPU. 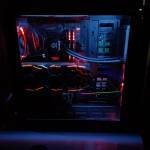 EKWB is known for its top-notch, quality components in liquid cooling under the custom loop. 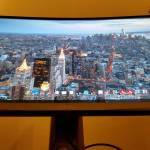 The company introduced their unique AIO in 2015. Reeven has entered in this market segment recently with their 240mm CLC named Naia. When it comes to the air cooling the first name that came to mind is Noctua. This is what Noctua has earned themselves a very effective brand association with the customers. Designed in Austria, Noctua’s premium cooling components are internationally renowned for their superb quietness, exceptional performance and thoroughgoing quality. Noctua originates from a collaboration between the Austrian Rascom Computerdistribution Ges.m.b.H. and the Taiwanese cooling specialist Kolink International Corporation, pooling more than thirty years of experience in the development, manufacturing and marketing of high-end cooling components. 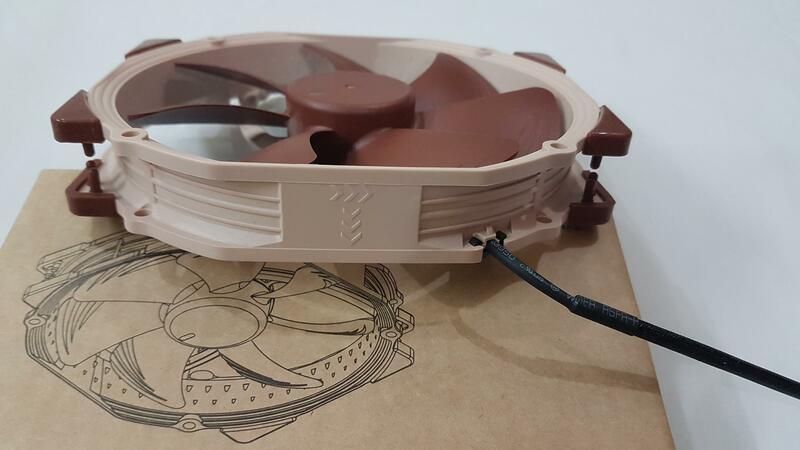 Established in 2005, Noctua took international silent enthusiasts’ hearts by storm and quickly developed into one of the most acclaimed suppliers of premium quality quiet cooling products. Today, Noctua is present in more than 30 countries across the globe and working with several hundred sales partners. Chosen by noise-conscious PC users, system integrators and industry clients alike, Noctua has become synonymous with impeccable quality, excellent customer service and class-leading quiet cooling performance. 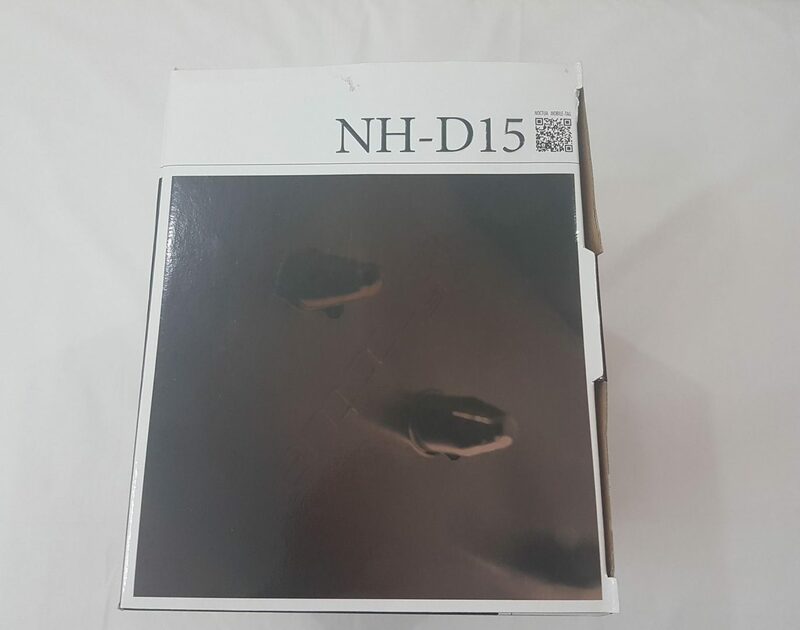 Today, I will have a look at the company’s highest-end cooling solution aka NH-D15. 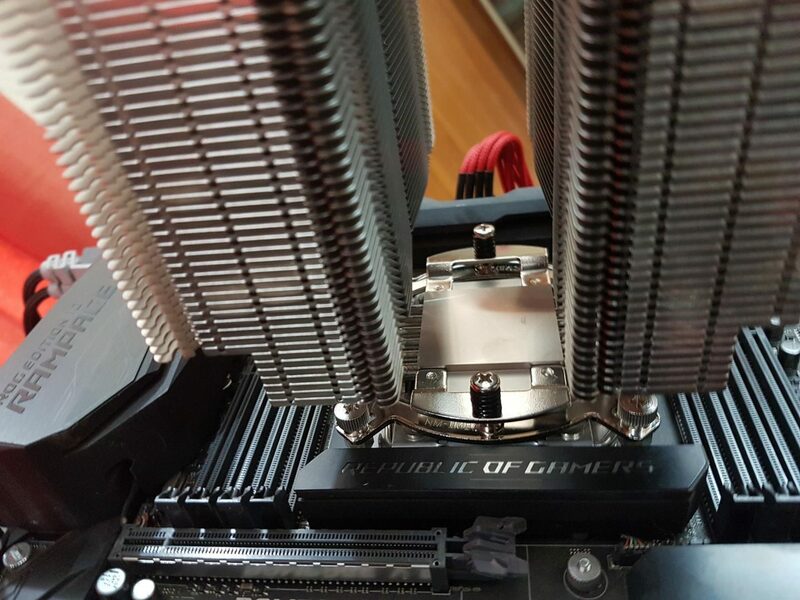 Noctua NH-D15 is a 140mm dual tower CPU air cooler supplied with their two powerful NF-A15 PWM fans. This monster is based on award-winning NH-D14 but has been adjusted for better clearance and more cooling optimized. 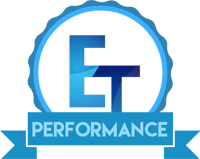 How does it perform? We are here to test right that. The cooler comes in a larger colorful cardboard box. The front side of the packing box has the cooler’s salient features summarized. A sliver color sticker is attached on the right side with the text “based on the award-winning NH-D14”. Cooler’s model is printed on the top and the left side. Noctua brand name and logo are printed on the bottom right side. On the back side of the packing box, Cooler’s salient features and technologies are printed. Cooler’s model is printed on the left side. 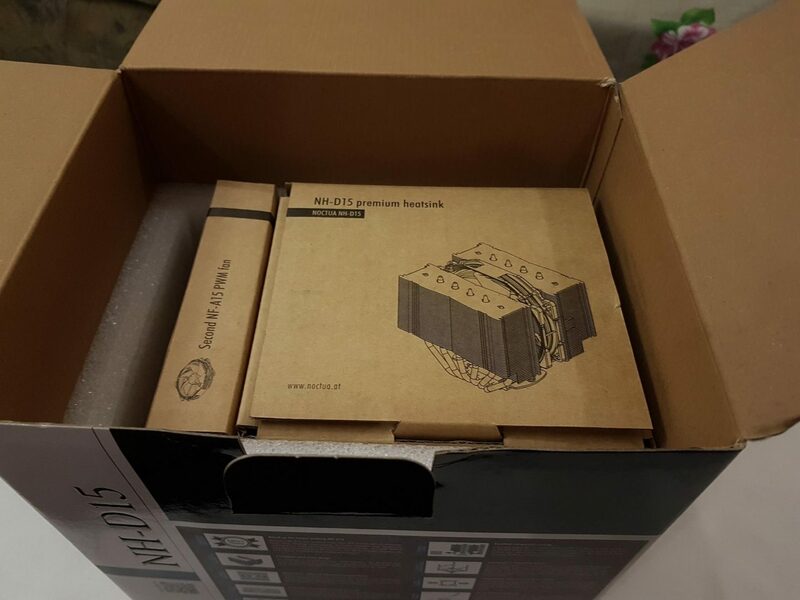 The left side of the packing box has salient info on the Noctua’s flagship cooler in 9 different languages. EAN and UPC info labels are printed on the right side. The right side of the packing has the detailed specs of the cooler (heatsink and the fans). Cooler’s dimensions are highlighted pictorially on the right side under the cooler’s model. Warranty info is mentioned on the bottom right side. The top cover has the cooler’s top side pic highlighting the Noctua brand name on it. Cooler’s mode is printed on the left side. Opening the box would reveal the contents. There is a container box with all the supplied accessories and the user guides. 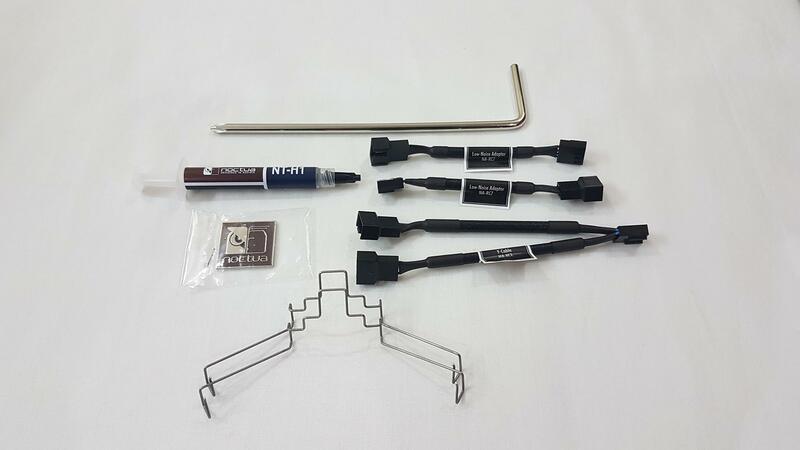 Noctua has included a plethora of accessories even a screw driver which I have found quite useful. Their legendary thermal paste NT-H1 is also included. Removing the top container box would reveal two more boxes. One is the NF-A15 PWM fan and the other is of the cooler itself. I am literally impressed with the details of attention from Noctua to their packing aspect. There are white color foam paddings for safety during the shipping and the boxes are made of corrugated sheets for added strength and safety of the contents. Accessories box will be discussed in coming section. 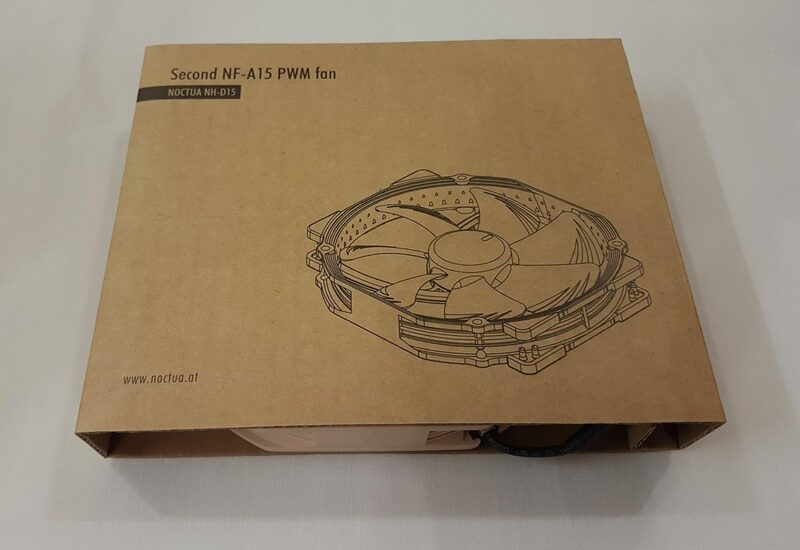 The second NF-A15 PWM fan comes in a separate box. 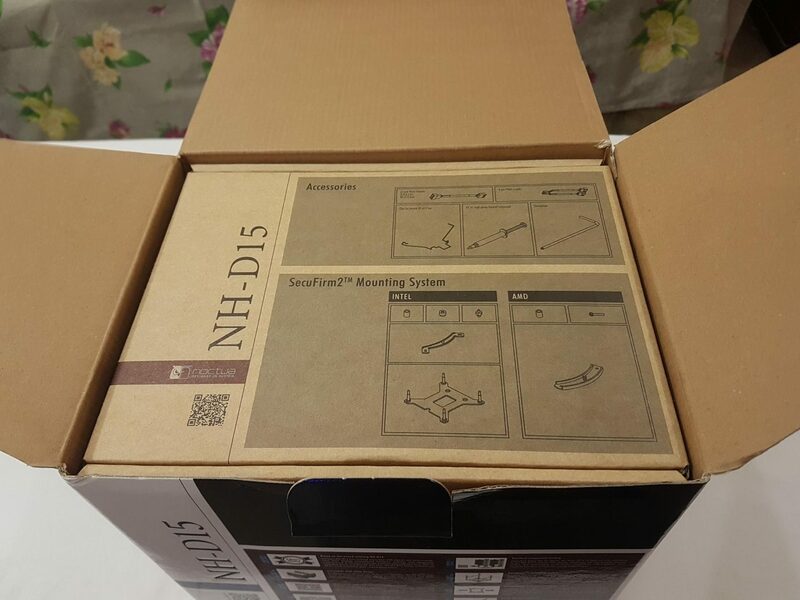 Fan’s picture is printed on the box and the model is printed on the top right side. The cooler is packed in its box in a layered manner for further protection and added rigidity. Cooler’s pic is printed on the top and the model is printed on the top left side. Opening the box would reveal the side of the cooler. Even there is a protective sheet inserted between the mounted fan and the other tower covering the complete top of the cooler. The accessories box has two main pictorial sections on the top side. The top section shows the graphical representation of the bundled accessories like Low Noise Adapters, Y-Splitter, Fan Clips, Thermal paste and the screwdriver. 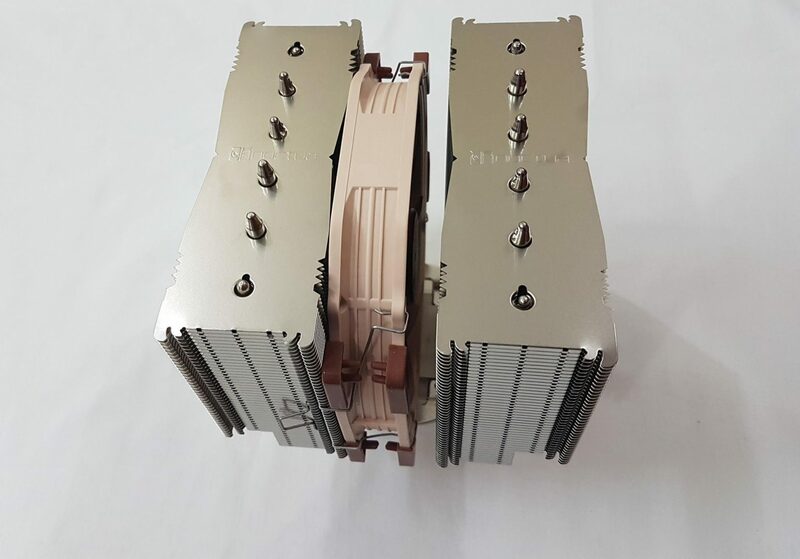 The bottom section focuses on Noctua’s legendary SecuFirm2 Mounting System. Opening the box will reveal the contents. We have three sections of the box. The top left section contains all the necessary accessories for the Intel platform. 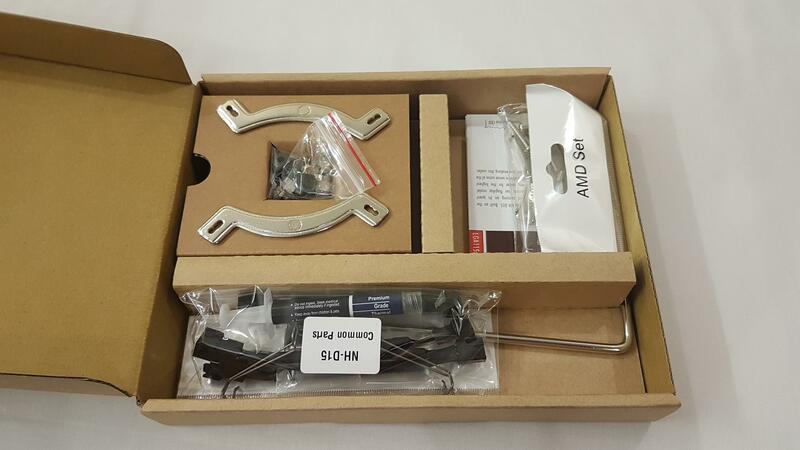 The top right side contains mounting accessories for AMD platform. 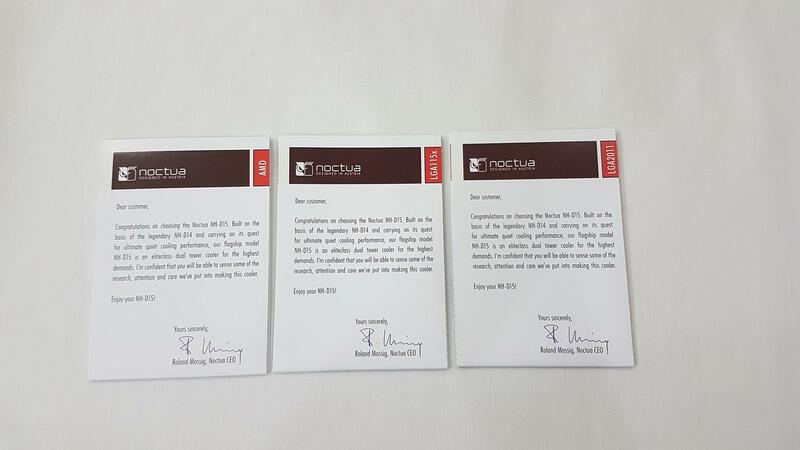 Noctua has provided three users guides. One is for the AMD. Second is for the Intel 2011 socket and the third one is for the other Intel sockets. I like this approach and the use of good quality paper with colorful printing and helpful pictures to help the users for installation really gives much more premium touch by the Noctua. The bottom section contains common parts like the screwdrivers, two fan clips, thermal paste etc. 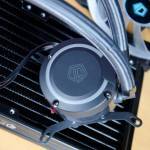 Air cooling has been at the heart of the PC cooling for quite some time though we have seen quite a fierce competition from CLCs in this segment but that has not undermined the air cooling market. Air cooling is still considered safe as compared to the leakage risk which could potentially destroy the components. 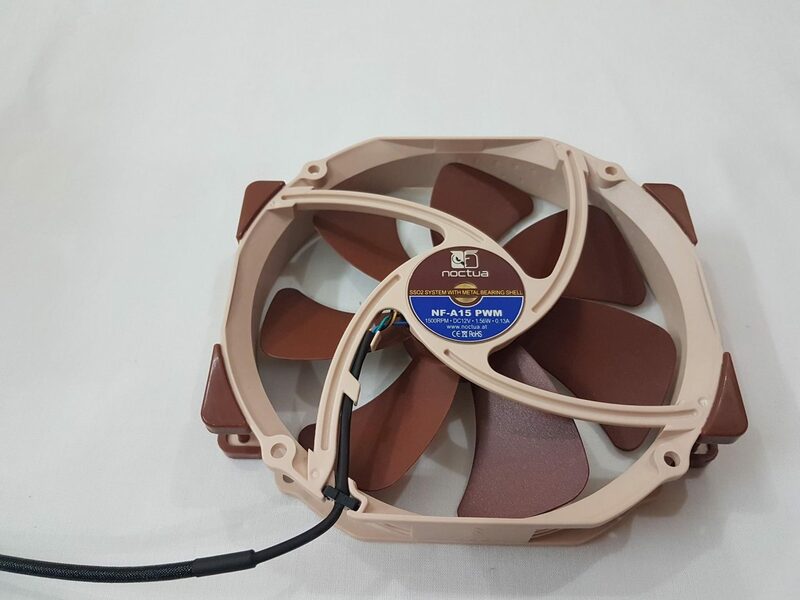 Noctua has always provided their customers silent yet effective cooling solutions. NH-D14 was the table turning cooler for the Noctua. 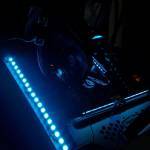 The NH-D15 is now the crowned king taking the place of the legendary NH-D14. 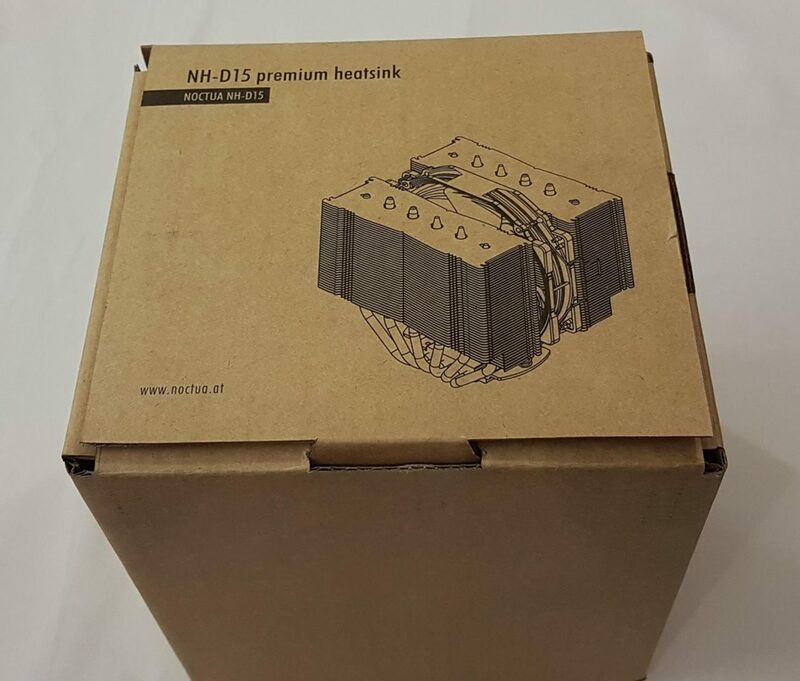 The NH-D15 is a D-Type cooler which means it has dual or two heatsinks instead of more traditional single heatsink approach hence taking the air cooling one step ahead. 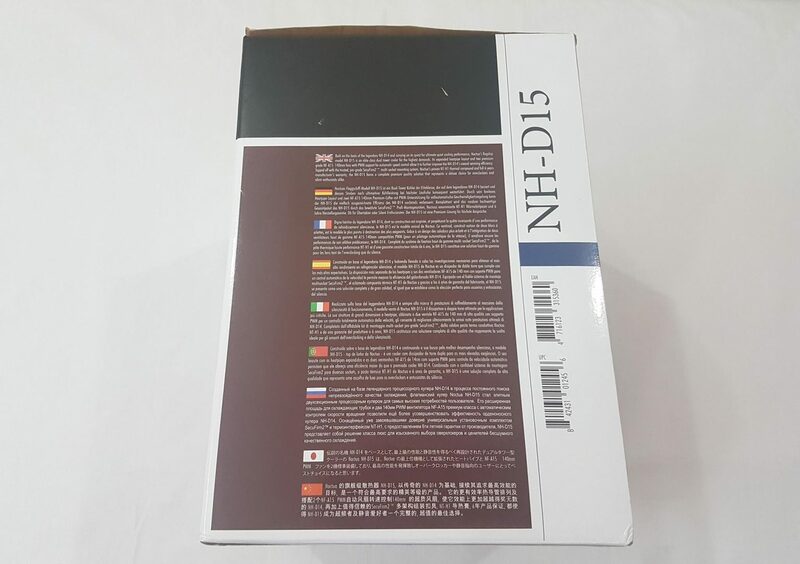 NH-D15 enjoys everything that NH-D14 has but Noctua has made some changes with the NH-D15 which has not only allows better compatibility but yet with same or better cooling and silent operations. 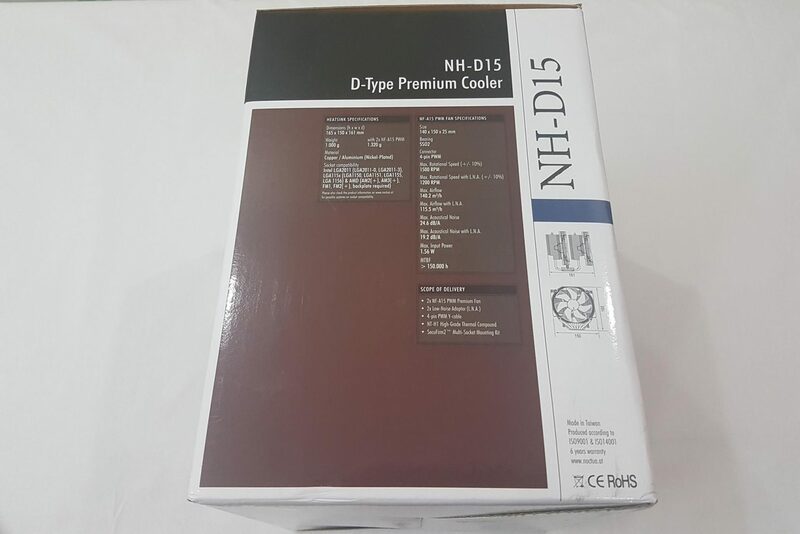 The NH-D15 is a D-Type 140mm cooler with two heatsinks and two 140mm fans. Taking this approach results in more surface area, better heat dissipation coupled with good air flow by using two fans. Let’s take a look at the top of the cooler. 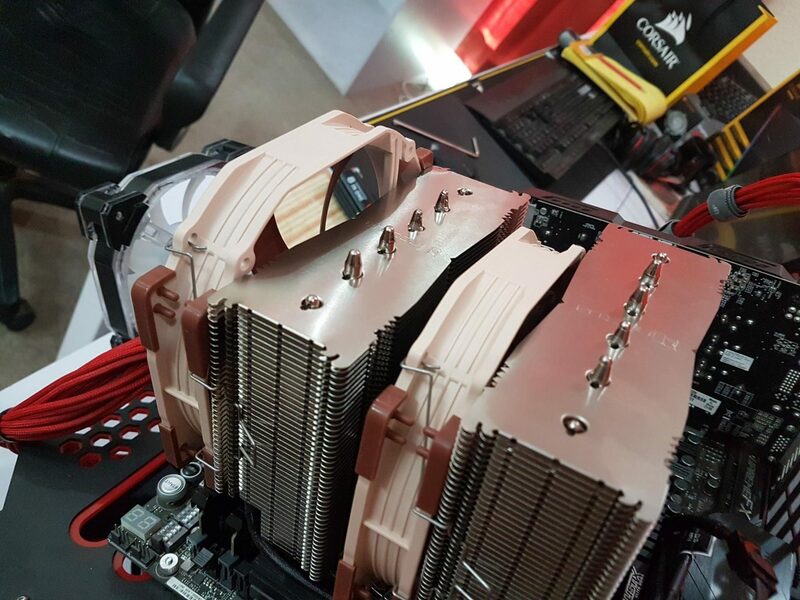 Noctua is maintaining the industrial look and feel of their coolers. 6 heat pipes are coming out of the each heatsink and crimping. 4 out of 6 heat pipes are crimped right out of the first fin plate while the two are done while remaining inside with their tips just being exposed. This pattern is on the both heatsinks. 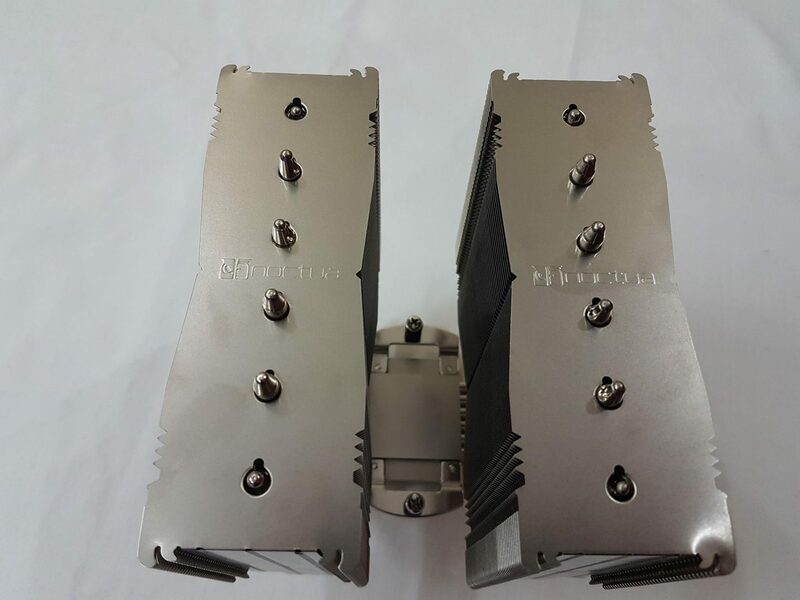 Noctua brand name and logo are embossed right in the middle of the top fin plate on both the heatsinks. 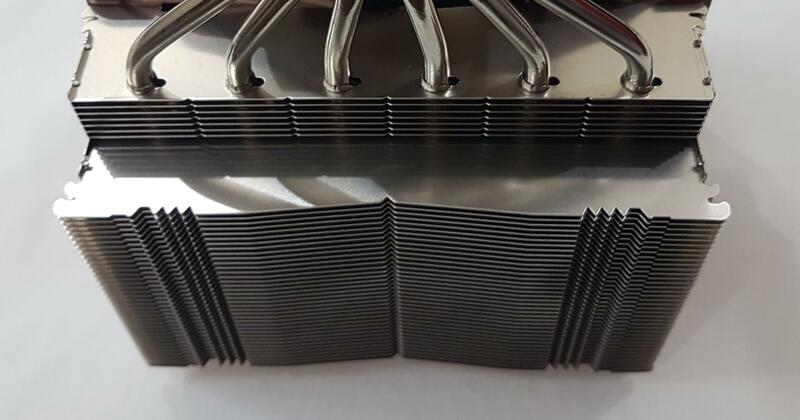 The heatsinks have a curvy design on the edges of the heatsinks. Note the triangle shaped edges are facing the exterior most heatpipes on both the heatsinks. Let’s take a look on the sides of the cooler. The left and right side of the cooler are symmetric. Same goes for the inner sides of the heatsinks facing each other. 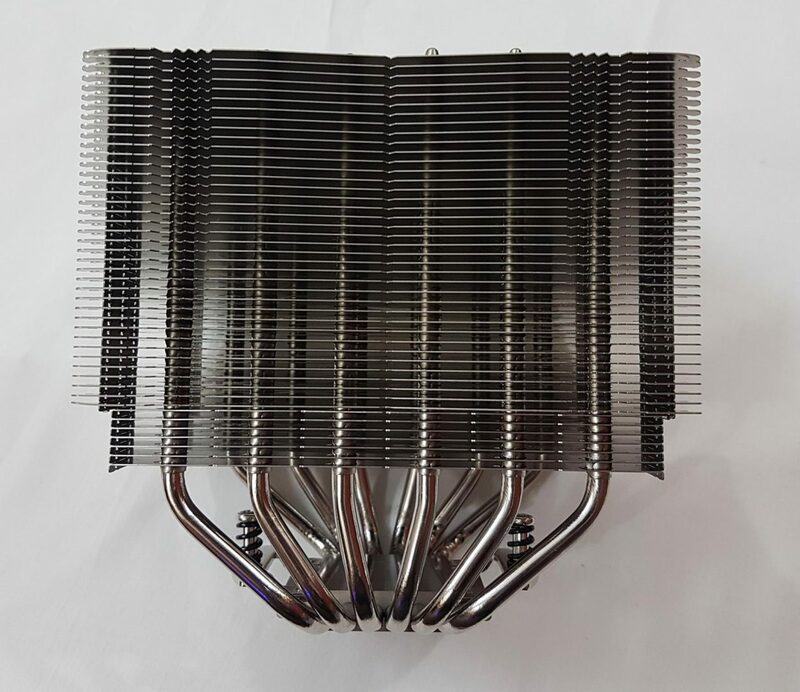 We have 6 heatpipes coming out of the base and going in the heatsink in a linear manner with equidistance between any two heatpipes. 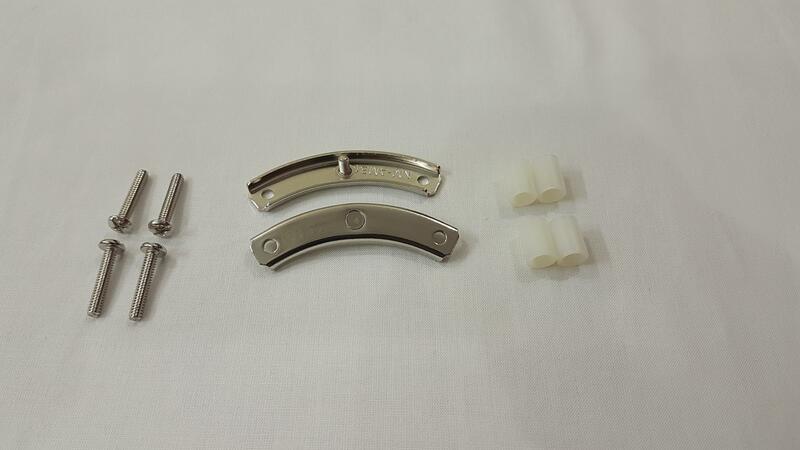 Each pipe is of 6mm thickness and its material is copper with nickel plating. Noctua has not compromised on anything here. 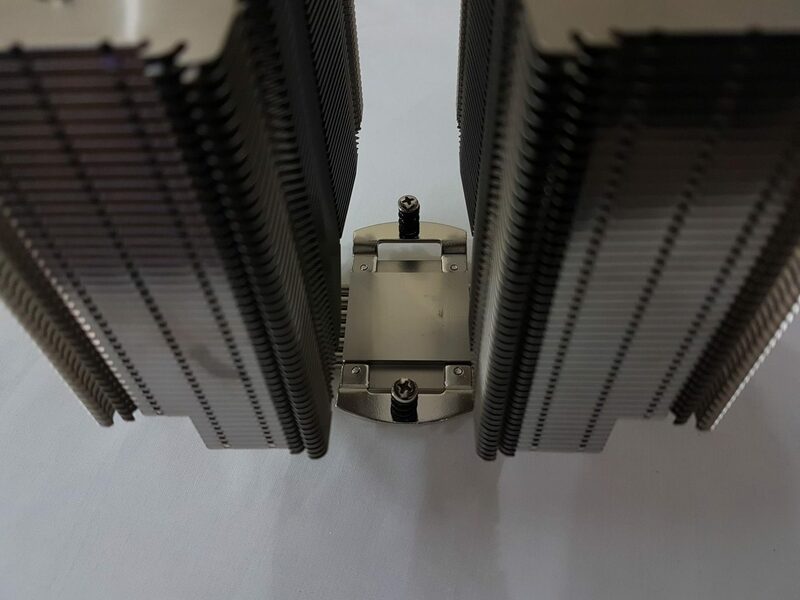 Each stack or heatsink is more widened than the NH-D14 and width of each stack is 150mm. 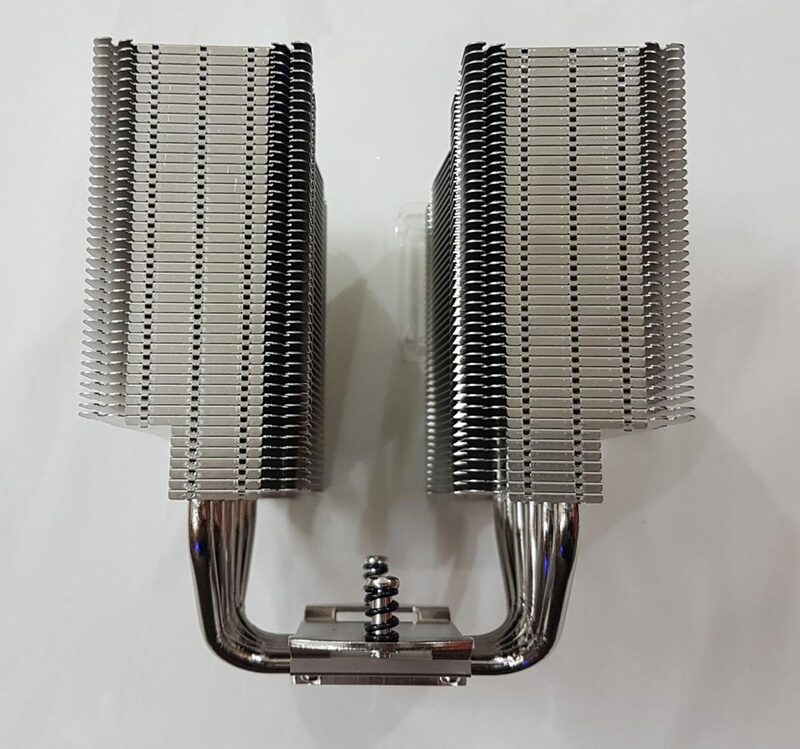 Hence we have wider stack and 6 heatpipes are making point of contact with the fins at regular distance enabling it to have more surface area and better and uniform heat dissipation. What is different in the fin design than the NH-D14 is that the fins on NH-D15 are bit thinner which makes sense as we have more surface area at the disposal due to wider stacks. Fins are made of aluminum and are nickel plated. We have total 45 fins on each stack. Another difference from the NH-D14 is the stack design at the bottom. Instead of having a uniform block from both sides, the fin stacks have been implemented in two steps. There are 38 fins on the top stack followed by a step and then 7 fins on its lower portion. The lower portion of the fins is shorter by 19mm and its total height is 14mm. This approach has enabled the Noctua to give their users better RAM clearance for as high as 64mm tall RAMs. Look how far down the middle fan goes. This gives another advantage of directing air in the surrounding area of the CPU socket to cool them. Fins on the exterior are angular in design. Let’s take a look at the left and right sides of the cooler. Both sides are symmetric. The stepped fins design is clear from this angle. The middle portion of the stacks is covered but the leading and the trailing fins are not covered. This helps in more directed air flow through the fin stacks. Heatpipes are going right in the middle of the stacks. Let’s take a look at the base of the cooler. We’ve a copper base coated in nickel plating mounted on a block. Dimensions of the base are shown in the picture below. 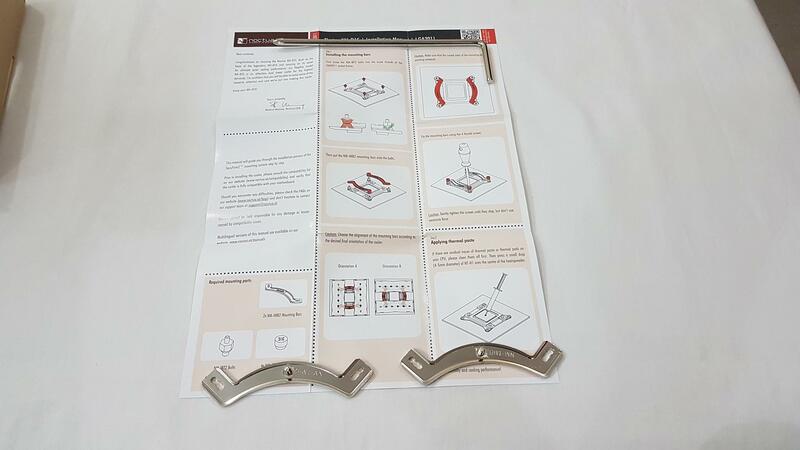 It is mounted on another plate with the help of 4 screws. 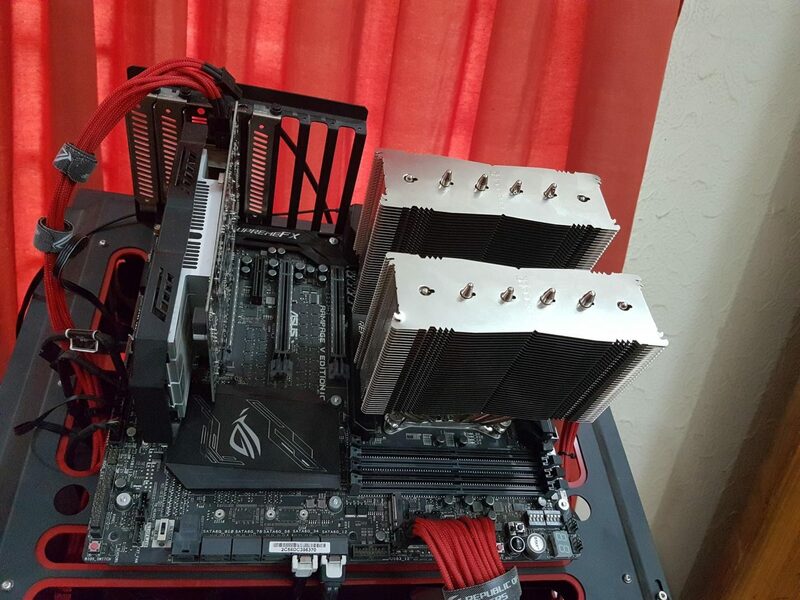 That plate is what mounts the cooler on the CPU. It has two spring-loaded screws. 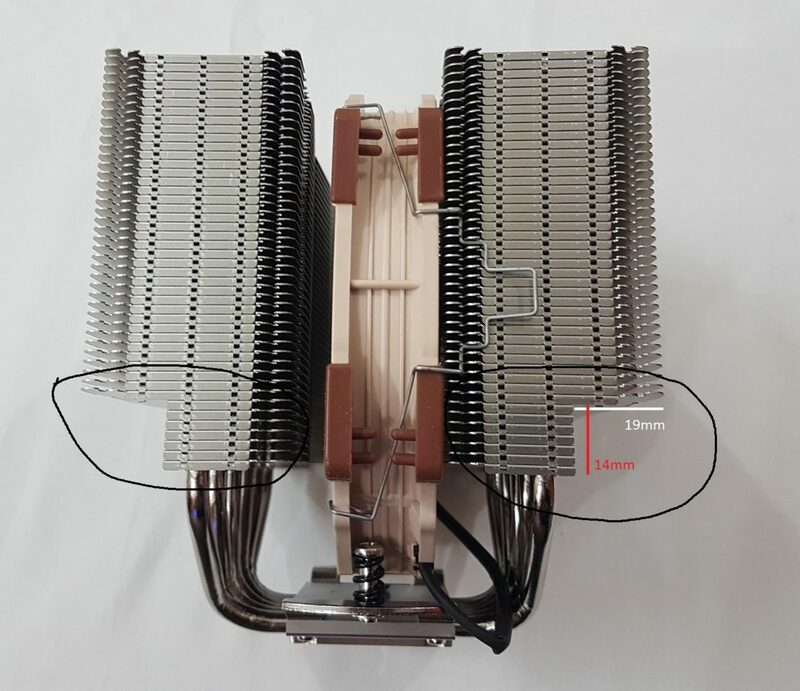 6 heat pipes are clearly visible going through the block. And spreading across the fin stacks evenly. 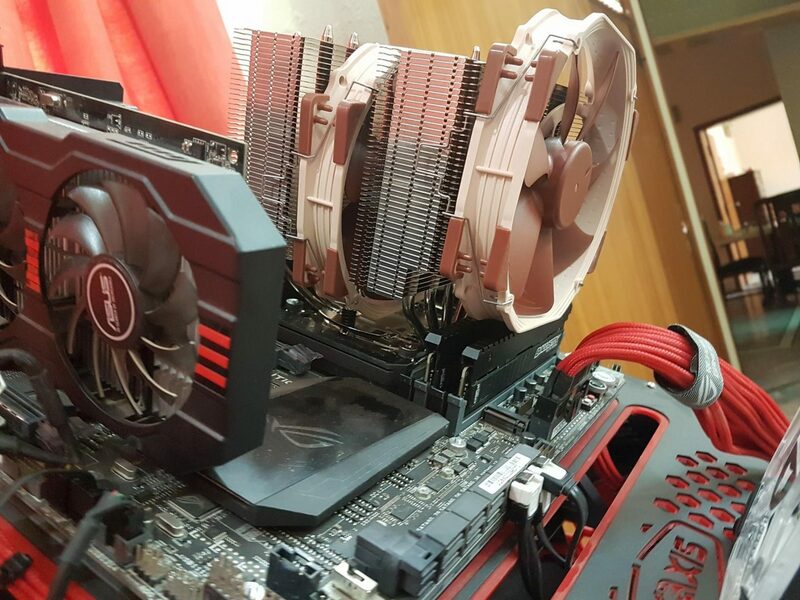 The Noctua has provided two of their high-performance NF-A15 fans. 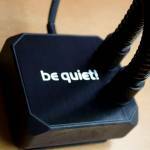 Noctua has provided two Low Noise Adapters as well in the accessories should the user wants more silent operations. Honestly saying, I really don’t feel any need for these adapters. I tested the cooler with both fans at 100% of speed which is 1500 RPM +/- 10% and they were silent. These are 140mm fans with 120mm mounting on them. They bear SSO2 bearing which is Noctua’s own design. The self-stabilising oil-pressure bearing (SSO-Bearing) system has always been at the heart of Noctua’s award-winning premium fans. SSO combines the proven concept of oil-based hydrodynamic bearings with an additional magnet that supports the self-stabilisation of the rotor axis. Due to the axis being stabilised by the magnetic field, Noctua’s SSO Bearing achieves higher precision and better longevity than conventional ball-, sleeve- or hydrodynamic bearings. SSO2 is the further optimised second generation of SSO. Made possible by the use of metal bearing shells and new injection moulding techniques, the magnet is now placed closer to the rotor axis and thus exerts higher magnetic force to it. This results in even better stabilisation, precision and durability. These are PWM fans. Power cables are sleeved and are approximately 215mm in length. Maximum air flow is 82.57 CFM. Using LNA the maximum air flow is 68.03 CFM approximately. 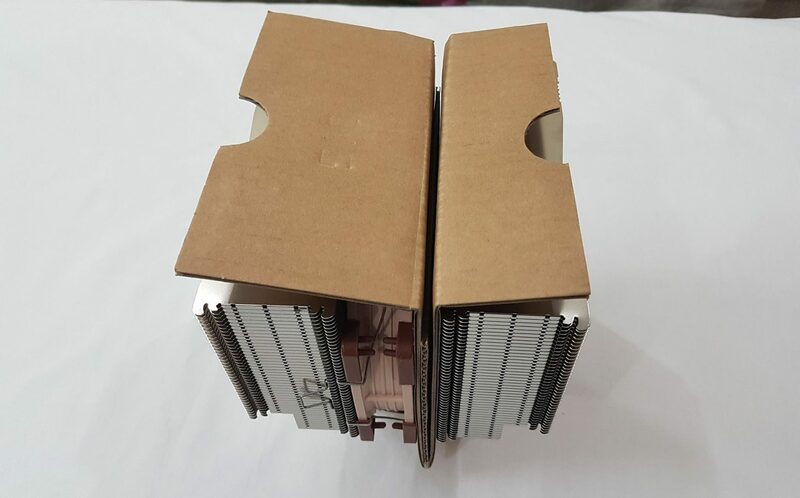 Please note that I have converted these units as Noctua specify these numbers in m3/h. Maximum rated noise on these fans is 24.6 dBA which can be further reduced to 19.2 dBA using the supplied LNA. The power draw of these fans is 1.56W, 0.13A at DC 12V. 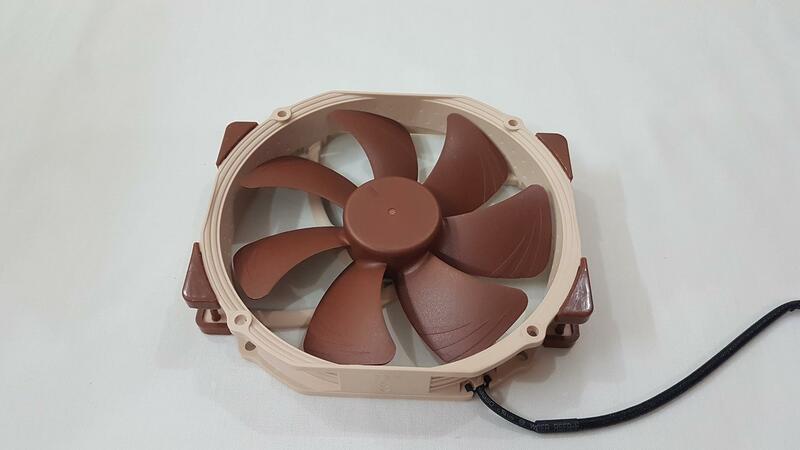 These fans bear the traditional Noctua’s beige color. Air flow direction and blades rotation direction are mentioned on the outside of the main frame. 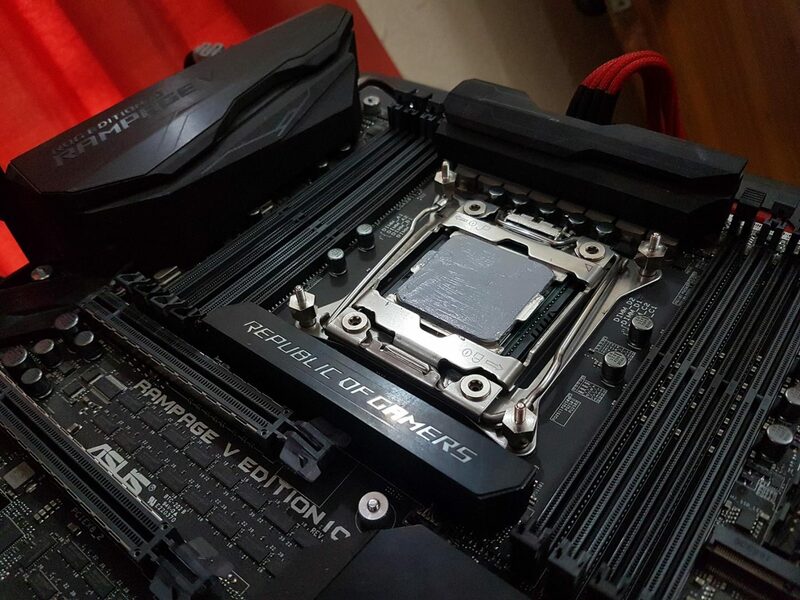 To test the cooler, Asus Rampage V Edition 10 based on socket LGA 2011-V3 (X99 platform) was used. 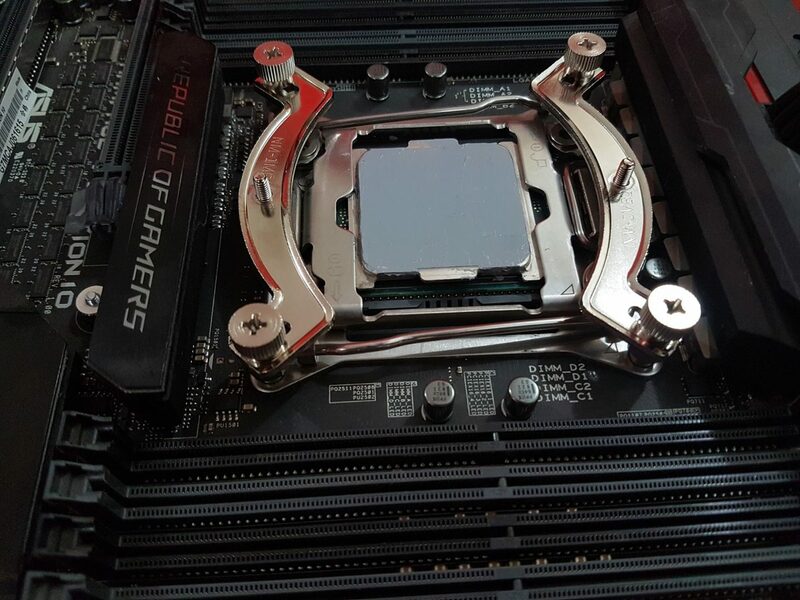 On this socket, there is no need to install the back plate but for AMD and Intel LGA 115x/1366 sockets, the back plate would be required. I started with the thermal paste. I use Cooler Master MakerGel Nano Ultra on my test bench to ensure the standardization and to normalize any performance benefit with the supplied thermal paste. The Noctua has included their premium thermal compound NT-H1. Next up we need to put the 4x 2011 screws on the pre-drilled holes around the CPU socket on the motherboard. Tighten them with the hands. Now, take out the supplied Intel mounting bars. The cooler can be installed horizontally or vertically depending upon the space availability and clearance from the first PCIe slot and DIMMs. Place the mounting bars opposite to each other such that the curve sides are pointing outwards. Now, use the 4x metal nuts/thumb screws and tighten the mounting bars. Take out the middle fan from the cooler. 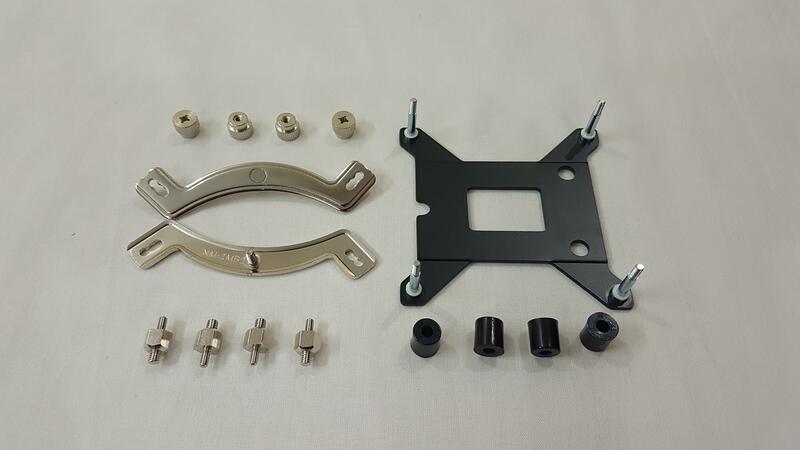 Place the heatsink on top of the mounting bars in such a way that the spring loaded screws on the heatsink align with the screw holders on the mounting bar. Press the heatsink from the center and begin to screw them in using the screwdriver. Make sure to use few notches on each side otherwise cooler may not fit properly and could result in lower thermal performance. Now comes the critical section equally as important as the thermal performance itself. There are three important areas to always check for whenever buying an air cooler. These are Clearance for the chassis, Clearance from the first PCIe slot and the Clearance for the DIMMs. The Noctua NH-D15 has the dimension of 165mm x 150mm x 161mm (H x W x D) with the fans on. 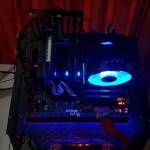 Chassis having CPU cooler height clearance of 165mm and above only can accommodate this cooler. 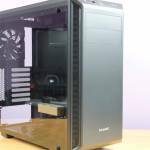 Users would need to check the specs on the chassis to see if the cooler can be fitted inside that chassis. For example, Corsair 780T has clearance for the CPU cooler up to 200mm height. Corsair 570X has a clearance of up to 170mm height. Phanteks Enthoo Evolv ATX has clearance up to 194mm. All these chassis can accommodate this cooler easily. Now take NZXT S345 Elite. It has a clearance of up to 161mm which makes this cooler not compatible with the chassis just by the margin of 4mm. 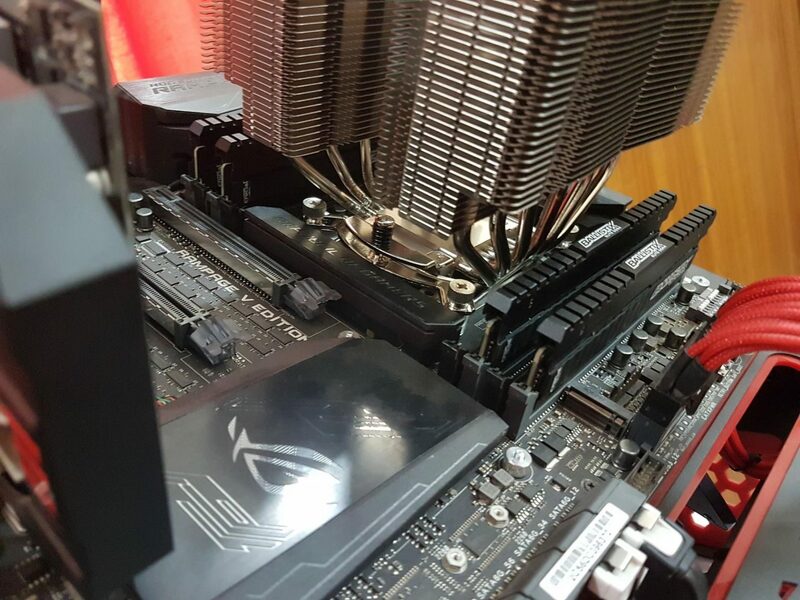 The first PCIe slot on the Asus Rampage V Edition 10 is closer to the socket. It was a tight fit with cooler almost touching the Asus GTX 750Ti’s PCB. I would like to have a graphics card with backplate just in case for added safety. This cooler, thanks to its stepped implementation of the fin stacks has a clearance of RAM up to 64mm height. 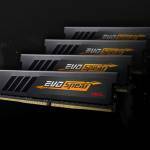 The RAM used on the test bench is Crucial Ballistix Elite DDR4 which has a height of 40.75mm. Without the front fan, it was all good fit with the heatsink. But to install the NF-A15 on the front side of the cooler, I had to raise it by 23mm. This creates another limitation for the chassis clearance as the total height in my case is 165mm + 23 mm resulting in 188mm. Something to keep in mind. 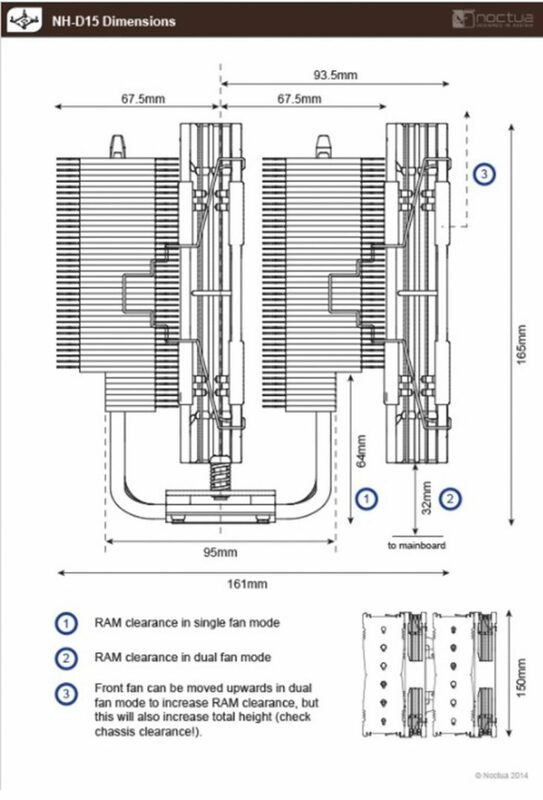 Check the below pic for a better understanding of the RAM clearance. Cooler Master MasterGel Maker Nano Ultra was used during all tests. Following software were used for the testing and monitoring. Testing was done on Microsoft Windows 10 x64 Pro edition. CPU core voltage was set to manual to avoid the voltage spikes and to ensure the standardization among all tests for better calibration of the data. Fans were set at 100%. The cooler was tested on stock settings for 30 minutes stress run to take the temps readings. Minimum and Maximum values were recorded from the software. With overclocked CPU, the stress test was run three times on each cooler for 15 minutes duration with 30 minutes interval between each run to ensure that components cool down sufficiently before next run. This was important to take the near accurate readings of the temps. DRAM voltages were fixed as well. 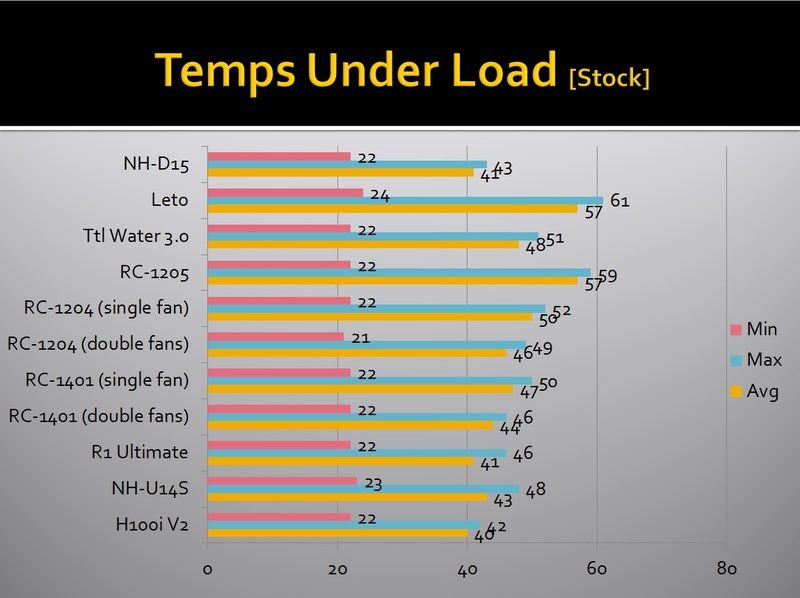 Corsair H100i V2’s pump was set on High-Performance mode during all tests. Fans were not connected with the unit. 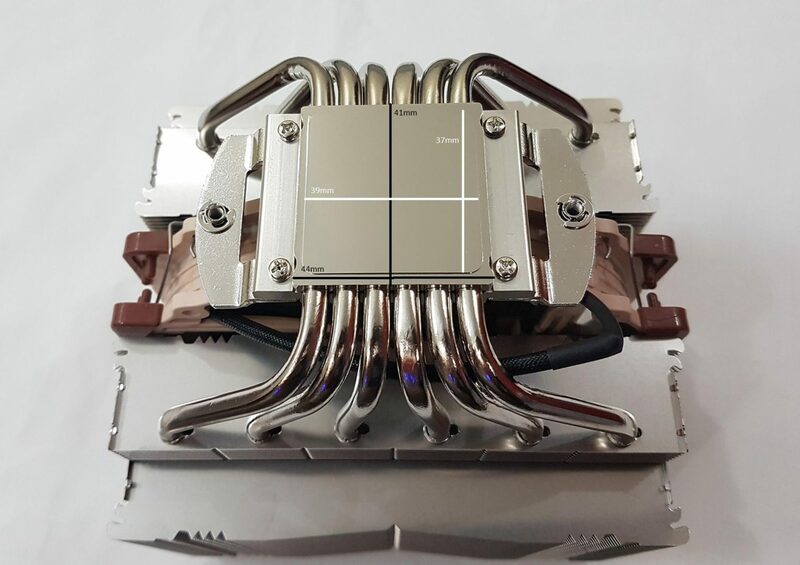 Fans on H100i V2 were connected on the motherboard’s PWM header which was used for other coolers as well during complete testing. 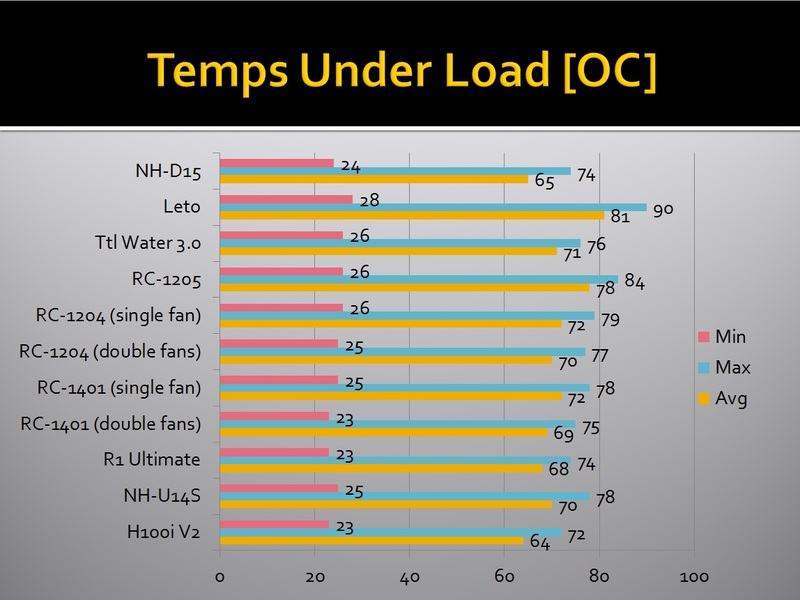 Temps during gaming were also recorded with overclocked CPU for each cooler. First off with the test run on stock settings, minimum temp was 22C. Idle temps really don’t tell the tale. Max temp of 43C was recorded when the cooler was put under stress on stock clocks. This cooler has lived up to its name for sure. Next up is the result of stress test when CPU was overclocked to 4.40 GHz at 1.360 manual VCore. A maximum temp of 74C with the average temp of 65C was recorded. 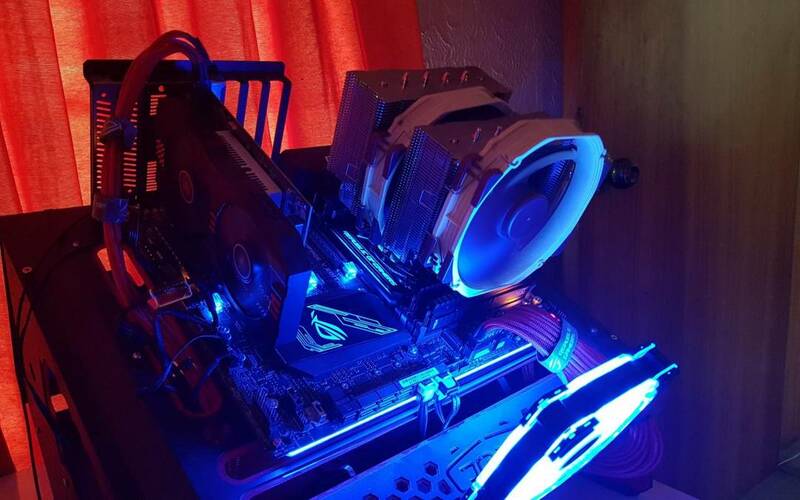 Amazing performance from an air cooler. Not only that, it has challenged the Corsair H100i V2 by going neck to neck against it. 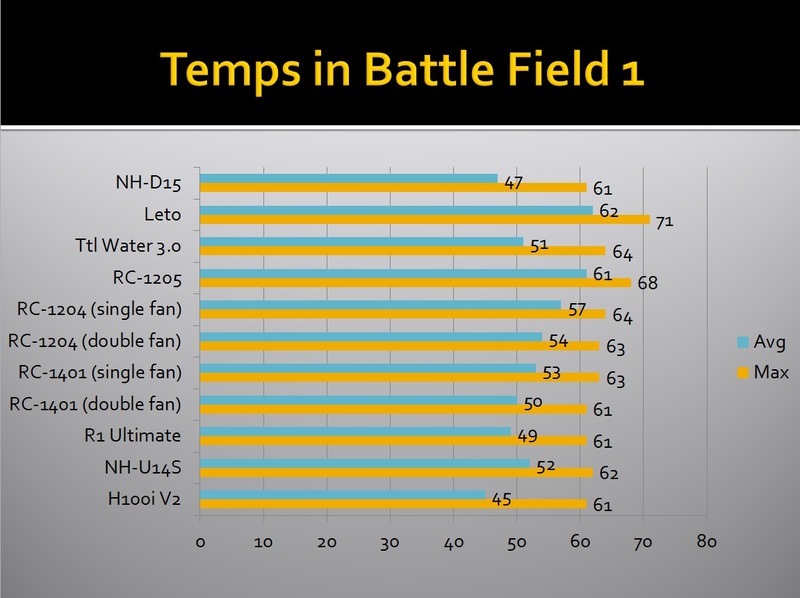 Battlefield 1 was used to test the temps while gaming. Max temps it hit on the CPU were 61C with average of 47C. Acoustic performance was right on the money. 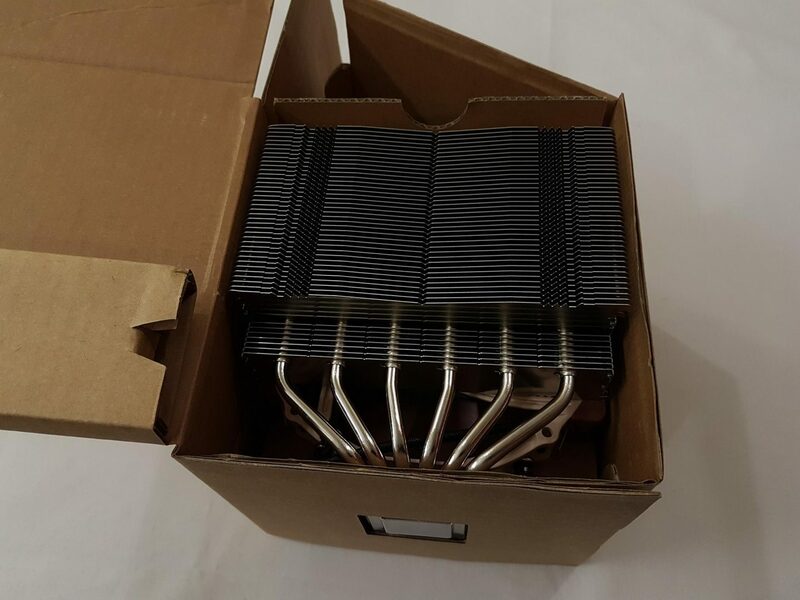 If Noctua is saying that this is their premium cooling solution with silent operations. They are absolutely right about it. 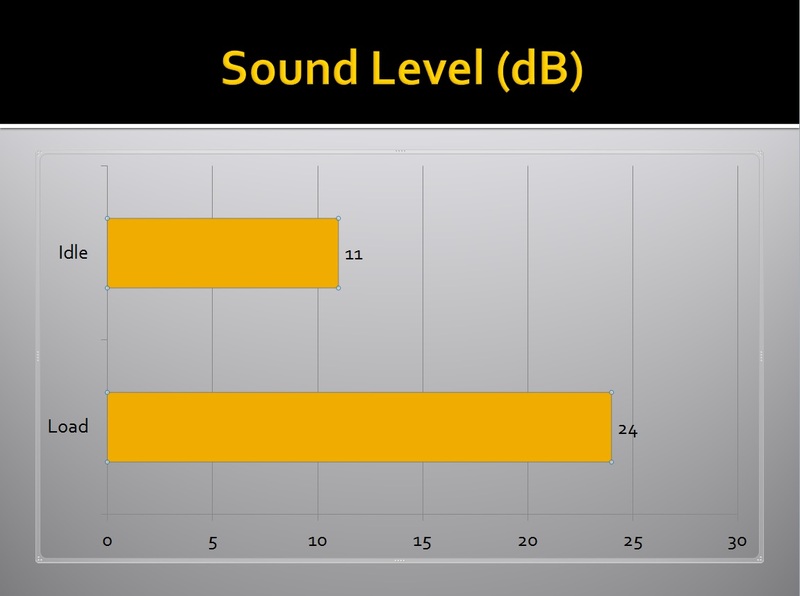 Foneso Digital Sound Level Meter version A0 was used to measure the sound level. Time has come to wrap it up. 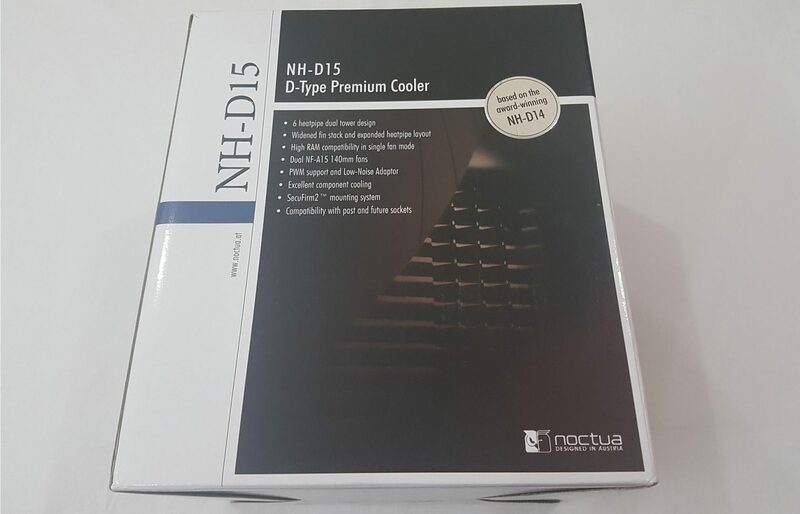 The Noctua has provided an ultimate cooling solution in the form of their premium NH-D15 which is based on the legendary NH-D14. Not only this cooler has continued the legacy of the NH-D14 but also provides better clearance and cooling potential. 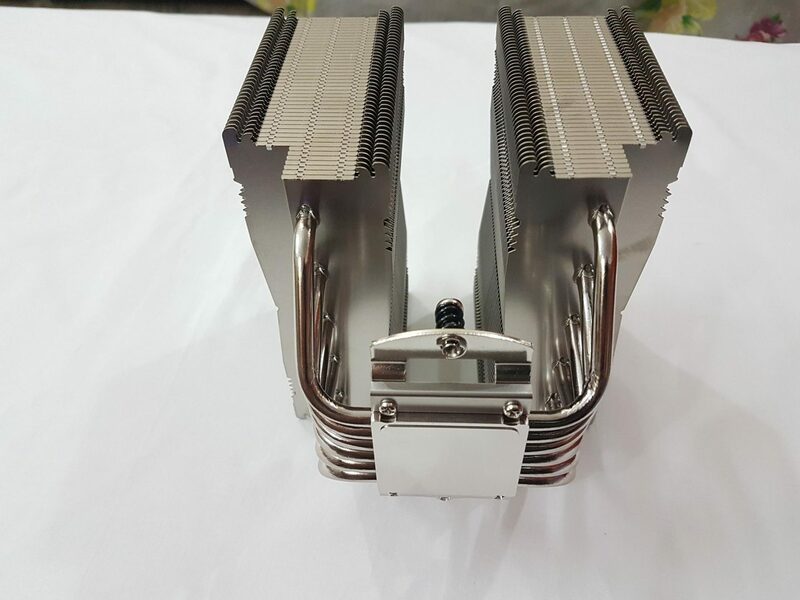 This is a 140mm D-Type cooler having dimensions of 165mm x 150mm x 161mm (H x W x D) with the fans on. It has 6 heat pipes making a linear contact with the fin stacks. The base and the heat pipes are copper made with nickel coating. Each stack has 45 fins on it. Each stack is wider than the NH-D14 having 150mm width. Fins are implemented in steps allowing the cooler to have up to 64mm of clearance for the RAM height. We have more surface area and the way heat pipes are implemented there is an even spread of heat across the surface for better dissipation. 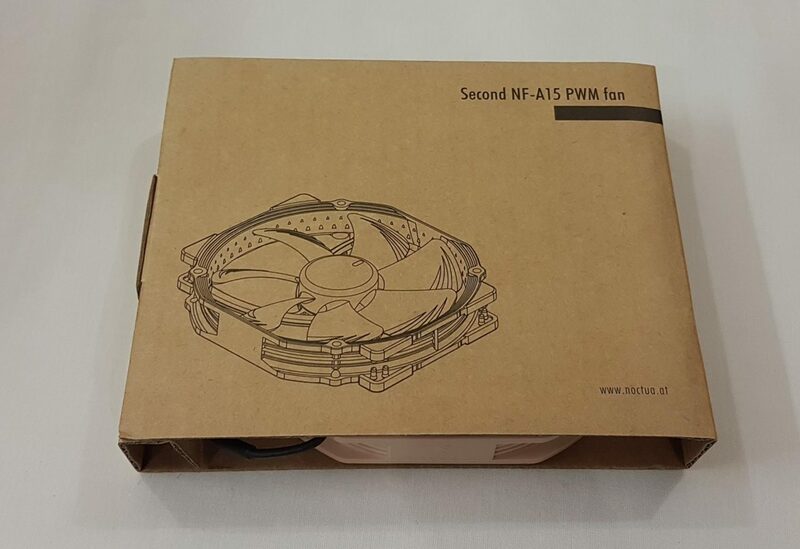 There are two 140mm NF-A15 fans included in the package. They are the high-performing PWM fans with maximum air flow of 82.57 CFM without Low Noise Adapter (LNA), noise level of 24.6 dBA and 0.13A. These fans have Noctua’s SSO2 bearings. SSO2 is the further optimised second generation of SSO. Made possible by the use of metal bearing shells and new injection moulding techniques, the magnet is now placed closer to the rotor axis and thus exerts higher magnetic force to it. 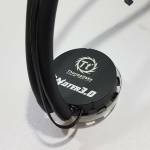 This results in even better stabilisation, precision and durability. The Noctua has bundled a plethora of accessories with the cooler. They have provided two Low Noise Adapters, a Y-splitter cable, their legendary NT-H1 thermal compound, three users guide (AMD, Intel 2011, Intel 115x/755) and even a screwdriver. And did I forget to mention that this cooler has 6 years warranty! Users would need to consider the clearance with respect to the chassis in particular when buying this cooler. It has a height of 165mm with the fan but when using two fans configuration with not low profile RAM the overall height of the cooler may increase than the 165mm height. Also, on my motherboard, it was a tight fit with respect to the first PCIe slot. Other than that, I have no other observation to report. 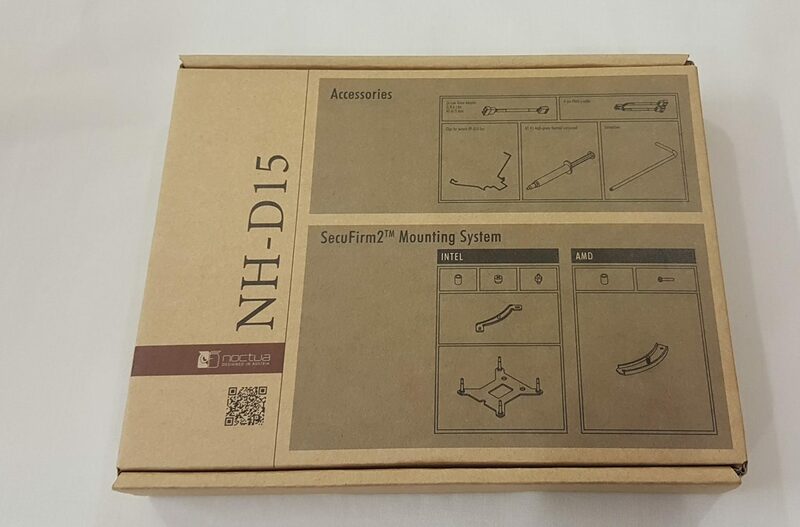 The price of the Noctua NH-D15 at the time of this review is $89.95. This is an absolutely stellar price. With this price and bundled package one is getting the absolute cooling solution that is already challenging the might of the Corsair CLC. With just 1-2C difference with the Corsair H100i V2, the Noctua NH-D15 has delivered quite a punch. It has also beaten the Cryorig R1 Ultimate though with a marginal difference. NH-D15 is definitely a king of air coolers tested so far on my test bench. What is more compelling is the fact that all this performance is delivered with silent operations. It is no brainer if this cooler has won our Performance award. 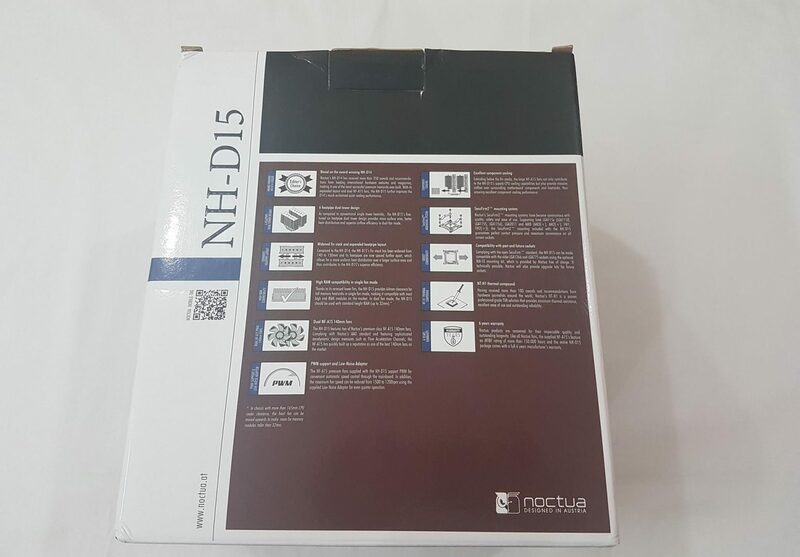 I am thankful to the Noctua for giving me the opportunity to review their NH-D15.